Sher Ray is an innovative organic skin care company. Her uniquely formulated skin care products use certified organic materials, are gluten free, vegan and are not tested on animals. Including several patented formulas, her products are created to slow the aging process by extending the life cycle of your skin cells. Sherry has been using her products since she created them in her dad’s lab in the early 1960’s. Her formulas have evolved over the years as new discoveries have been made. All are water free concentrates infused with natural minerals and therapeutic grade essential oils. CBD Topicals from Ladybug Hemp offer the highest quality industrial hemp CBD pain relief. Using the same high standards and natural ingredients that go into her skin care, Sherry’s CBD formulas are meticulously crafted to deliver the relief you need without THC or psychotropic effects. Each formula is paired with complementary essential oils that enhance effectiveness and are held to the highest testing standards in Oregon. 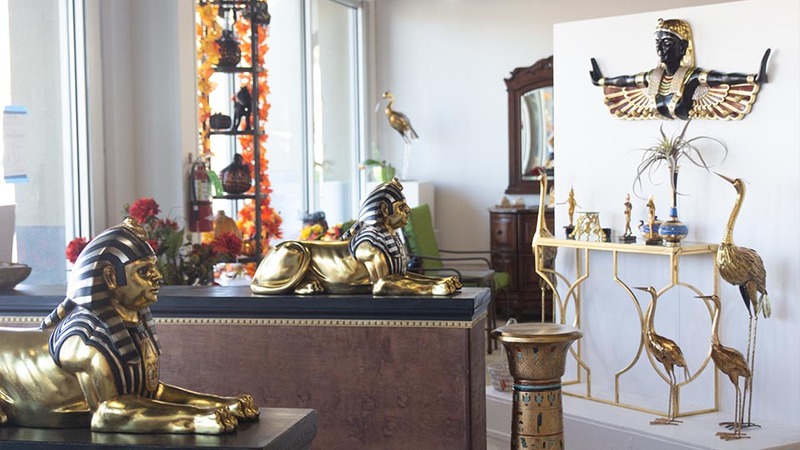 Sher Ray’s unique boutique features an ancient Egyptian theme with many visual delights and unique gifts for an experience you won’t forget. Coming soon: Sherry will be offering essential oil classes to show how they can improve your life and how to integrate them into your daily routines. You will be amazed by the wealth of knowledge Sherry has to offer!